Cyclists and walkers join forces to protest. 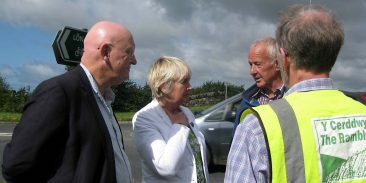 Three leading charities, CyclingUK, Sustrans, and the Ramblers Cymru are warning Welsh Government that its plans for the A487 Caernarfon bypass risk safety and do not provide enough provision for walking, cycling, and the vulnerable, some covered by the UK’s Equality provisions. The new A487 bypass would be routed from the A487/A499 Goat roundabout, heading north and skirting Dinas, Bontnewydd, Caeathro and Caernarfon, before rejoining the A487 at the Plas Menai roundabout, near Y Felinheli. Under the Welsh Government’s own Active Travel Act, road developers have a duty to consider and improve walking and cycling provision. But Sustrans Cymru, Ramblers Cymru and Cycling UK warn that those needs are not being considered properly. The public inquiry for the £125 million scheme is due to begin on Tuesday 13th June 2017 and campaigners are warning that time is running out. No additional walking and cycling links from the Bontnewydd area towards Caeathro, Cibyn Industrial Estate and the Bethel roundabout. No additional crossing provisions on the redesigned Plas Menai roundabout. “The Welsh Government was rightly proud when the National Assembly passed the Active Travel Act in 2013, but its current plans for the A487 bypass risk riding roughshod over that landmark law. If Welsh Government is to go ahead with the bypass scheme, it is essential that it does so in a way that protects safety and improves access for walking and cycling. With the public inquiry expected to end in four or five weeks, the three charities, who have all lodged official objections, have called on Ken Skates, the North Wales-based minister responsible for transport, to re-think plans and propose improvements. “We’re building a bypass that will last for generations. Mistakes made will be set in stone for years to come, so it’s vital Welsh Government gets the layout right the first time round. “Failure to do so will jeopardise safety, restrict access and ultimately cost the taxpayer more in the long-run. Lon Efion and its users demand to be protected. This is the latest critical test for Active Travel. The three charities are demanding either a bridge or underpass directly across the Goat roundabout, separated from the motor traffic likely to increase in the years to come. See for yourself some of the folk to be found walking and cycling on Lon Eifion. Don’t they need to be encouraged and protected? Cycling UK, the national cycling charity, inspires and helps people to cycle and keep cycling, whatever kind of cycling they do or would like to do. Over a century’s experience tells us that cycling is more than useful transport; it makes you feel good, gives you a sense of freedom and creates a better environment for everyone. The Active Travel Act (2013) places new duties for highways authorities to consider the needs of walkers and cyclists and make better provision for them, not least in every new development. It also requires both the Welsh Government and local authorities to promote walking and cycling as a mode of transport. with our campaigning for the same thing on the Guild Wheel route around Preston. I do believe all of the ideas you have introduced in your post. They’re very convincing and can certainly work. Still, the posts are too short for beginners. Could you please lengthen them a little from next time? Thanks for the post. Your advice appreciated. Will try to do better. Greetings! I’ve been following your site for some time now and finally got the courage to go ahead and give you a shout out from Huffman Tx! Just wanted to tell you keep up the fantastic work!